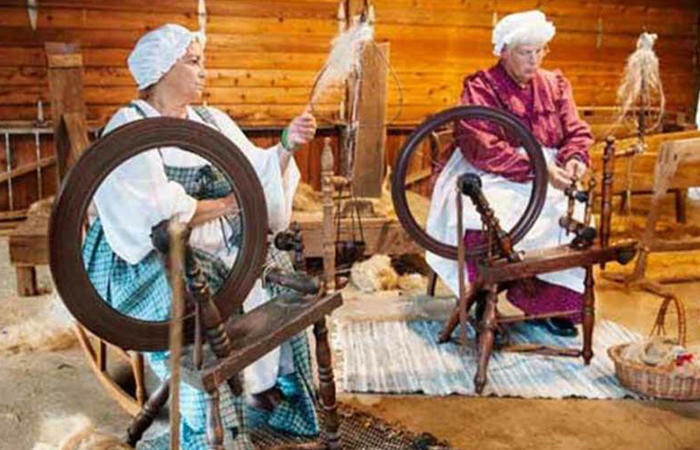 Before clothing stores, textile mills and Eli Whitney’s cotton gin, there was linen. The process used at the Flax Scutching Festival in Stahlstown today was the process used by our ancestors in the New World and the Old World: (1) harvesting and drying the FLAX plant, (2) breaking and SCUTCHING for the separation of fibers (3) hackling/heckling to prepare fibers for (4) spinning into thread and (5) weaving the thread into linen cloth. Traditionally, farming families would gather after the harvest to share the labor-intensive chore of turning flax fibers into linen. These gathering quickly became social events with food and music. In 1907, local Justice of the Peace, Elmer N. Miller, conceived of an annual reunion to celebrate the valley’s history and homey pleasures. Thus, the Stahlstown Flax Scutching Festival was born. The festival continues to reflect all these rich traditions by drawing upon more than 200 years of oral traditions. At the first festival it was estimated that 1,800 horse-drawn rigs were parked on the grounds. Enjoy Entertainment on the outdoor stage. Experience Civil War and Revolutionary War Militia encampments. For the child in each of us explore activities for both young and old. Buckwheat Cakes and Sausage, a festival tradition. Enjoy the Mock Indian Raid – another festival tradition that portrays happenings in this area. Marvel at the antique farm machinery. Sample homemade soups and fresh pressed apple cider. Observe the educational and fun demonstrations that are found on the grounds. Visit the kitchen for homemade soups, sandwiches, sides and plate lunches. Wander in the Flax Scutching Historical Area and enjoy learning about the history of the area and maybe find an ancestor connection or two? Sunday Morning enjoy outdoor worship. Price: $4 per person; children under 12 free.